In my house the one Patriots bye week of the season is practically a national holiday (for me anyway). We jam pack all the fun fall activities into that sweet Sunday. Sooo........we went to a corn maze! 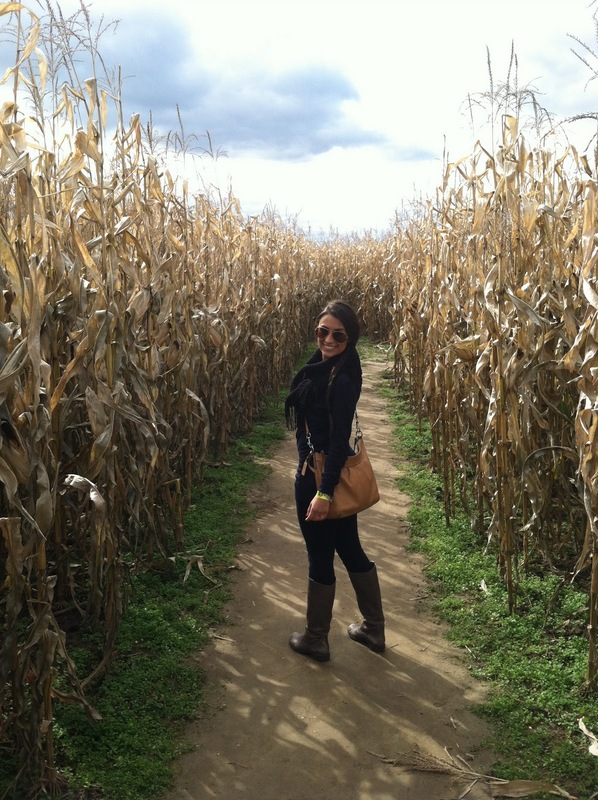 We went to Sherman Farm in New Hampshire for the coolest maze/maize around! It's shaped like Tim Thomas holding up the Stanley Cup (which was a draw to the man-friend). It was about an hour away so we grabbed some essentials (iced coffee of course) and hit the road! I lead the way (Cam would say he did ;) and we made it out and just under 40 minutes. After, we had the most amazing cider doughnuts which we ate too fast to get a picture of. The maize was fun and everyone at the farm was very friendly. We got some great leaf peepin' in on the way too! We picked up some goodies from the Sherman Farmstand to take home. Low fat Chocolate milk, Spicy Dilly Beans (my fav) and apple butter :) Next on the agenda, Halloween Costume planning and Whole Foods to fill up our bare cupboards!